After many, many months of checking, play, and revision from myself and Drew Metzger, we've finally launched the second edition of the Ogre Miniatures rulebook. This edition features brand-new miniatures painting and photography by Ben Williams; a cover by Brandon Moore; a set of 24 two-sided Ogre record sheets; and die-cut blast templates for spillover fire. 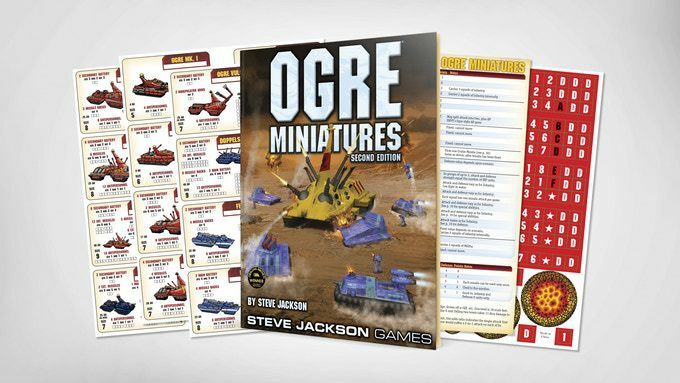 Easy to learn and fast-moving, Ogre Miniatures is miniatures armor as it should be played. The original release won the Origins Award for Best Miniature Rules. The Kickstarter launched yesterday, and it will be a short one, running about 2.5 weeks. As of this writing, we are only about $2,500 away from our funding goal! To be notified when future Kickstarters launch, follow us on Kickstarter (if you don't already).